Crispy Onion Bhajis make the perfect naturally gluten free and vegan snack or starter. Light, crispy, and completely moreish! Hey! Remember last week when I mention that fiiiinally jumped onboard the foodie train and bought myself a Spiralizer? Well it was about damn time! I loved my handy little julienne peeler – it was easy to store, easy to clean, easy to use. But I’m pretty much done with slicing the ever loving you know what out of my fingers every time my mind wandered in the middle of a job. Nope! The only thing I’m slicing is going to be basically everything in my kitchen…other than me that is. I found this recipe in the Spiralize Now cookbook that I snagged for cheap at TX Maxx (side note: isn’t it weird that it’s called TJ Maxx in the US and TK Maxx in the UK?). Within five minutes of opening my new kitchen toy I flipped through the book and decided upon this recipe for these crispy onion bhajis. These bhaji’s require no special ingredients, just a few spices, an onion, and coconut oil for frying. If you don’t own a spiralizer yet no worries. You can still make these by slicing the onions by hand, but there might be a few extra tears shed in the process from all the slicing. I’ve recently learned that onion goggles are in fact a thing. Genius. Enjoy as a snack or starter- these onion bhaji’s won’t disappoint! Just be warned that they are seriously addictive. Don’t forget to #asaucykitchen on instagram if you try these Onion Bhajis! We love seeing what you make! You can also post your pictures to my facebook page! Place the flour, baking powder, salt, cumin, tumeric, chili, cilantro, and lemon juice in a large bowl and whisk to combine. Add in the water. Once you've got a thick batter, add the onions slices and stir to coat with the batter. I find this step is easiest if you just mix with your hands. Heat a large wok on the stove top on a medium heat and melt enough coconut oil so that you've got about a half inch layer of oil. 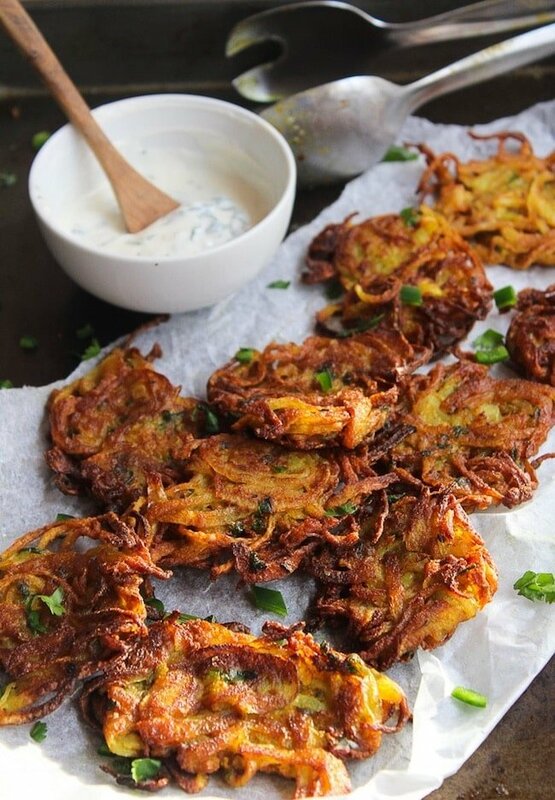 Carefully drop tablespoons of the batter into the hot oil cooking about 3-4 bhajis at a time. Fry for about a minute on each side and then flip the bhajis to get the other side until golden. Remove each bhaji with a slotted spoon and place on a plate lined with a paper towel to drain the excess oil. Continue until all of you batter in gone. Serve these hot on their own or with a cucumber mint raita and enjoy! I used left over Onions from the BBQ did a double recipe 600G of Onions and added some fresh Fennel about 100G and it was fantastic it gave the Bhajis a lovely crisp fresh flavor. LOVE fennel – that sounds amazing! Thanks Mark! Can you use anything else in place of the chickpea flour? The only flour I can eat is almond and coconut. Hi Lorraine! If you’re limited to almond and coconut flour then these might not be for you. Chickpea flour is very binding when wet which is the main thing that keeps these bhajis together. If you can have eggs you can try using almond flour and adding an egg for binding but I’m not positive that it would work. I have made these now couple of times and even kids love them. I did put egg into the batter as I found that the batter was crumbling. Thank you. Hi Andrie! Glad you guys enjoyed them! Can one mix flour & besan (half & half)? I would cook them in my Actifry using only a tablespoon of oil instead of deep frying. Healthy option. Hi Anis! I haven’t tried it with half/half flour so I can’t guarantee the same results but I do think that would still work! Can the recipe be prepared in advance kept overnight & fried the next morning? I haven’t tried keeping it overnight yet but I do think that will be fine. That being said I recommend prepping the batter and battering the onions just before frying so the batter sticks. Also – make sure that you let the batter come up to room temperature before frying. If you add cold batter to hot oil it will lower the oil’s temperature making for soggy bhajis. Hi your recipe looks really amazing but I would like to ask if I can bake them instead of fry them. Just made these and they are amazing! So lovely and crispy. Was looking for a recipe for onion bhajis to serve with curries, as we are low carb so don’t do rice or any kind of bread; these fit the bill perfectly and I am currently eating part of the test batch with some sour cream leftover from another meal. Yummy! Awesome! So glad you were able to have and enjoy them! These are fantastic! They are a favourite in our house now! Thx! Thanks Sylvie! So glad you enjoyed them! These look fantastic. Do you think that these could be made ahead of time and then re warmed and served as an appetizer? If so – how far ahead do you think they can be made and what is the best way to rewarm them? Thanks. Hi Wanda! In my own experience these really are best when served fresh – after awhile they start to loose their crispness. I have however seen other people make them in advance, let them cool, and then warm them up in the oven to put a little life back in them. frying, it will be crispier. I’ve made these twice now and we absolutely love them. Brilliant as an entree for a hungry crowd and so easy and delicious. Thanks so much for the yummy recipe. That’s awesome! SO glad you like them and thanks so much for coming back to let me know what you thought! These are bhajias not bhajis. Bhaji means vegetables in Hindi and this savoury is called bhajia. Made these tonight and they were absolutely delicious! I could eat a whole plate of them. Thanks for the great recipe!!! Ha! That sounds like something family would say 😀 Thanks for coming back to let me know how it went – so glad you guys liked them! Hi, Thanks a lot for this wonderful and tasty Bhaji recipe You’re a winner the web is awash with bhaji recipes but yours is unique, But I like to eat mine with tangy Tamarind Chutney. Thanks Jossy! Tamarin Chutney sounds delicious! I’ll have to try it! By thick batter do you mean paste-like or more like a thick salad dressing consistency? I’m thinking of a thick Caesar or something. Just trying to get a reference for how thick the batter should be. Thanks! Kind of like a thick dressing is probably the most accurate. The chickpea flour makes it feel sticky, but it’s not dense. The batter will drip off of the onions a little bit when you lift it out of the batter. Hope that helps & I hope you like them as much as we do! Successfully made these DELICIOUS bhajis tonight. As always with anything I try from the internet – I’m always sceptical, but hands down these were amazing. I cooked these for my mum, and she gave them a solid 9/10. Sadly I couldn’t chop the green chilli and coriander finely enough due to blunt knifes so made do with mild chilli powder. I served them up with vegan soya plain yoghurt and mint sauce with wholegrain rice. Thank you for sharing this recipe! Hi, I am dairy free and would love a good dip suggestion for these. I am definitely making these this week… or today!! Can’t wait! Hi Christen! 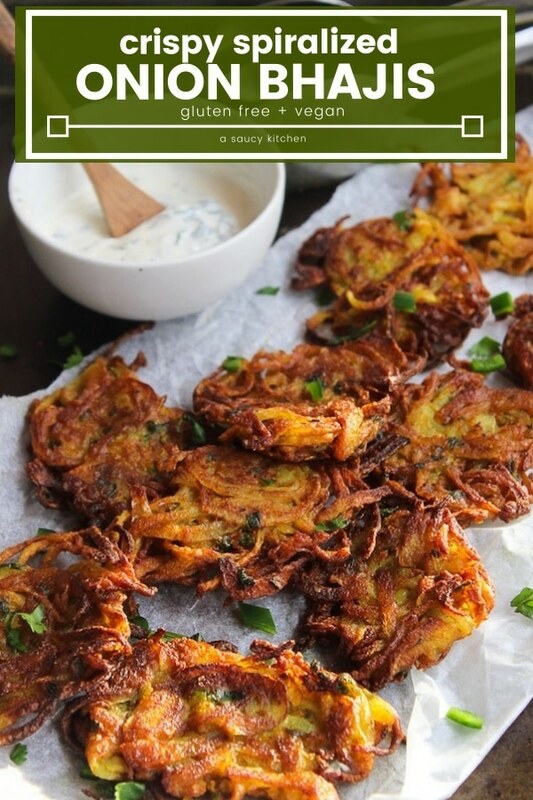 I usually see bhajis like these served with a Cucumber Mint Raita – this one looks like a good dairy free recipe you might like! It uses coconut milk instead of yoghurt.http://veganlovlie.com/cucumber-raita-mint-dip-vegan-recipe/ Hope you enjoy the recipe(s)! I’ve never tried these with coconut flour before so I can’t say for sure. If you did want to try it I would probably add only half the amount of coconut flour as you would gram flour. Coconut flour is extremely absorbent and too much here would probably be difficult to use as a batter. I’m vegan but not gluten free, would normal plain flour work as I don’t have any chickpea flour in! Can’t wait to make them! That should still work! It might taste a little different, but I think it would still be good. Hope you like them! Plain flour will make them dense. Chick pea flour works best because it works like the way flour and egg batter works. Good to know! Thanks Yasmin! Love ing the Bhajis I used a hand spiralizer worked perfectly. Thanks for the recipe. So glad you liked them! Thanks for coming back to let me know how it went! a mandolin will work just as well for the slicing. I’ve had one for years. Hi im paleo. Can i use a different flour other than chickpea? Cassava flour perhaps? Hi Deena! I haven’t tried it with cassava flour before so I can’t say for sure, but based on my experience using cassava flour I’m pretty sure it would work just fine. Let me know if you do try it that way! Have you tried baking them instead of using oil? These look tasty! What is gram flour? Was this a typo? I can’t wait to make theres. Sorry Amy! I forgot that gram flour also goes by garbanzo flour or chickpea flour. I’ll make sure to add that to the recipe. Hope you like them! They are super addictive!! And yes, that spiralizer has been on m wishlist for a while now! I need to get one soon. My son got a spiralizer for Christmas, and I’ve been a little envious! I love Indian flavors, and this is sure to be on my “to do” list when I get one… Yum! You’ll have so much fun when you get one! I’ve never used a spiralizer so interesting to hear your comments. I do love onion bhajis and your photos are extremely appealing. I need to get my hands on a spiralizer! This looks amazing! I’m not on board the spiralizing trend yet, but these look fabulous! I’m tempted. I just got a spiralizer too! Mine is a handheld version. I love that it can be put in a drawer and not take up much room. This recipe sounds amzing! I love Indian food, and especially Onion Bhajis. I pinned for later. Yay – hope you like it! I love everything about this recipe, especially the use of gram flour. I think this makes a great snack. I loooove gram flour – so versatile and so tasty! 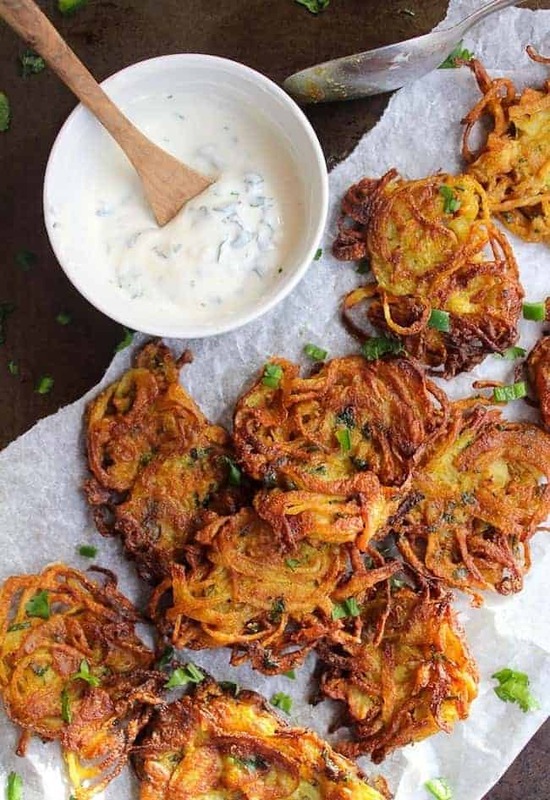 I love ONION BHAJIS so you may have finally convinced me to splurge on a spiralizer! i need tea and onion bhanjis so bad now…also i have been wanting a spiralizer for a long time now but dont have a space..someday. Someone mentioned a hand held spiralizer on here?? These look delicious. 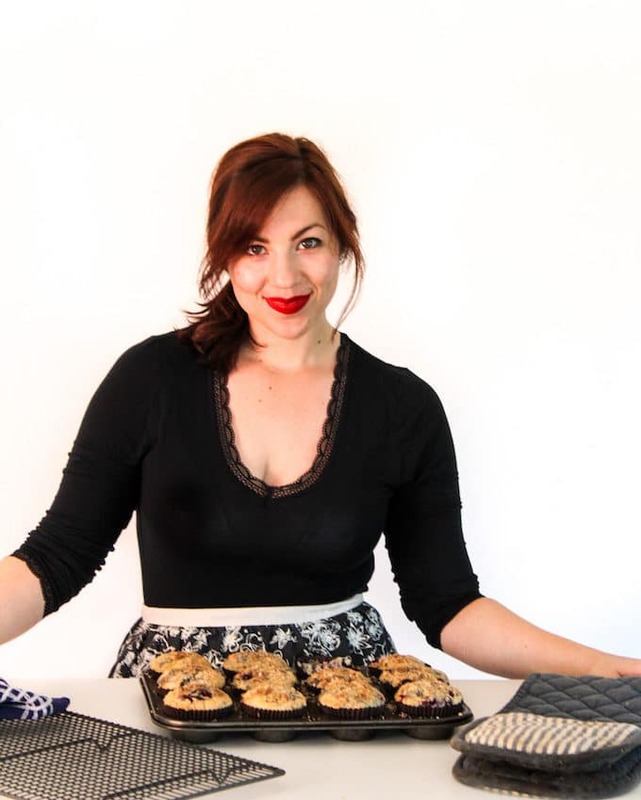 I love when recipes are naturally gluten-free. Going to have to add this to my pinterest board to try later!